Congratulations to Doris Powell, who was honored with a “Good People, Good Causes” award at the Pierre Area Philanthropy Luncheon on Nov. 7. Doris was nominated by the South Dakota Historical Society Foundation for the great job she does as a volunteer at the Cultural Heritage Center and the Capitol. Doris began volunteering at the CHC in 2007 and has donated 100 hours or more each year since then. She is always willing to help when needed. 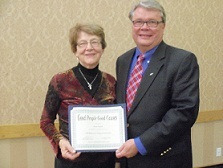 Doris is pictured with Foundation interim president Bill Peterson. Thank you, Doris, for being part of the great volunteers at the Cultural Heritage Center and the Capitol!